Yomega Corp and YoYoJam have announced a truly unusual collaboration…three new plastic yoyos manufactured by YoYoJam that will be distributed exclusively to specialty and mass-market retail outlets by Yomega! I spoke with Yomega President Todd Rywolt about the collaboration, and he gave me some insight into the project. We are launching three “YoyoJam X Yomega” models at the International Toy Fair in New York this month; the Journey, Odyssey and Firestorm. As you are well aware, Journey has been a beginner’s staple for years but has never been broadly marketed. We think it’s significant that a legendary throw (previously only sold at “boutique” toy stores and websites) will now reach a mass audience. The Odyssey is a re-vamped version of the original Surge design, with a new name and logo, again brought to a broader audience than ever before. 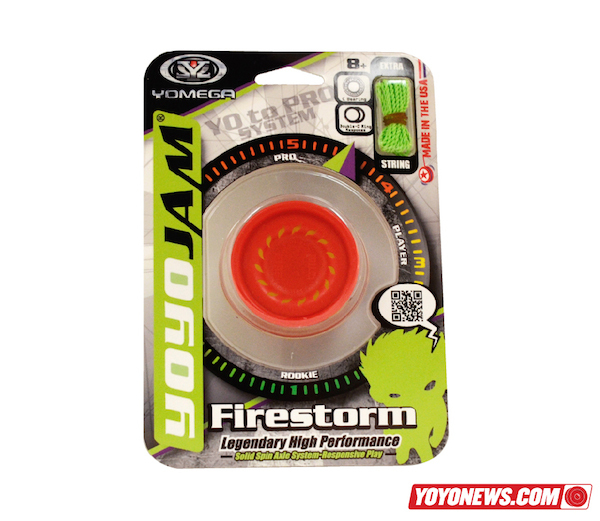 Firestorm is an all-new design – an incredibly solid, super-smooth new plastic yoyo. All three will be responsive out of the package with a half-spec bearing, but can be made unresponsive by cleaning the bearing or replacing it with a standard C-size bearing. All three models will continue YoYoJam’s tradition of being made in the USA, but with all-new package touting YoyoJam X Yomega. We think this is pretty exciting news and will help bring in new players! All three models should begin shipping to retailers in early March, and should be on shelves shortly after. We won’t know until after Toy Fair if any mass market retailers will be stocking these, but we’ll update if we hear anything! Specs and pics of all three models below. 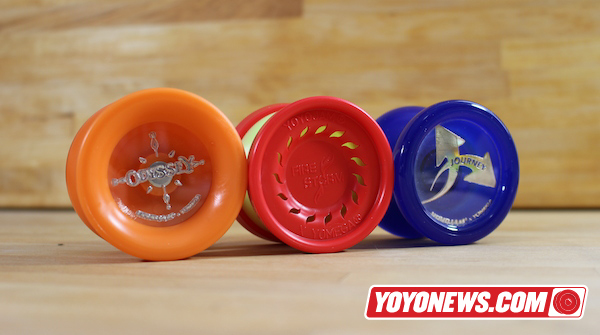 And YoYoNews has a FULL SET of these new yoyos that we’re giving away! Just reply to this article and tell us why you want them…we’ll pick one lucky winner on Monday, February 17th to get all three yoyos before they are available in stores! UPDATE: Congratulations to Christian, our lucky winner! Who won these beautiful babies? I want these for my club as incentives to learn new tricks. Everyone only wants metals and I want to show them how good plastics can be. I would like these because it all started with a Yomega. Yoyoing has seriously changed my life and brought me into a community I love and it’s all due to a Yomega Hyperwarp Heavywing. Also. I love plastic. I have an array of high end metals but 75% of the time I’d rather pick up a plastic. They just have a feel that I love. I love pushing myself by trying to do all my 30+ second combos on my plastics. Personally I just find the challenges in yoyoing to be the best part about yoyoing. And that’s why I’d like these throws. I want them because I AM a Steve Brown-noser. These are awesome – I want them because I love plastics and I want to share them with my friends. Great collaboration. I grew up with Yomega and YoYoJam and it would be awesome to feel nostalgic again and to give them away to new players. The two brands that got me into this sport are YoYoJam and Yomega, so I will put all my effort to buy these three throws. But seriously. Give these yoyos to Ben from Nairobi. Gimme, I love plastic throws, what can I say! My first modern yoyo was Yomega and my first non-responsive was YYJ. So winning these new throws would be like reliving my growth in the great activity of yo-yoing. My first modern first yoyo was Yomega and my first non-responsive was YYJ. So winning these new throws would be like reliving my growth in the great activity of yo-yoing. to throw them… what else? I need these yoyo’s. I’m really excited to see that yoyojam and yomega can do together. Because I love teaching new people to yoyo, and they need a yoyo for that! Yoyos here in Nairobi are pretty hard to come by. And when you do, they are either pretty cheap and fall apart before you can land a man on the trapeze OR so expensive to kids here that they’d rather convince their parents to get a bike instead. I have ended up scavenging in open air markets for yoyos. If I’m lucky, i’ll get a Yomega Brain. If I’m kinda lucky, a generic yoyo that is sturdier than those in the toy store or supermarket but still fragile (yes, the ones in supermarkets are sad…). If I’m not lucky, I’ll get nothing and start searching again in two weeks. The yoyos that I got though have built a good deal of interest in my neighbourhood. and i get more kids coming to my place to learn, with fewer yoyos to use. Oh!, even though i don’t get to win these three, would be great to have these companies focus some (however small) efforts on helping to bring up players from Africa. So that kids coming up don’t feel that this is a western/asian sport. I want to win these so I can save my money for a fancy dinner. I want these yoyo’s because … first and foremost I want to play them and give a user review and share my thoughts. I wouldn’t have purchased most of my yoyo’s without reading a user review of some sort. After that I’ll end up giving them away. I throw in public a lot… and alway’s end up giving away my extra throw away if someone is interested and ask for a how to. It’s alway’s fun to put a yoyo i someone’s hand… give a quick tutorial … and when they try to hand it back say “Keep it … it’s yours.” … More often than not it’s a kid about my sons age. Putting a big grin on a kids face and making their day is awesome. it’d really appreciate and love a chance to own these new plastic throws. Ive never had a yoyojam before and i remember being in elementary school and watching yomega demos. seein kids get brains and such when i couldnt made me super jeally. This collab from these two company is an amazing thing. I want these yo-yos because they will be great for my collection. I have no doubt that they’re fine yo-yos, but what’s really important is the potential scope of distribution. YoYoJam makes great products, but doesn’t have much brand recognition outside of the yo-yo community. Yomega has the marketing power to get people’s attention, and for that, I expect this set of yo-yos will introduce a lot of new players to modern yo-yoing. I have no reason to buy these yo-yos for myself, I have plenty of perfectly good yo-yos I already own. But to have a first run edition Yomega Brain, for example, is an important piece of yo-yo history, and I have no doubt that these will follow suit. I want these yoyos to help benefit less fortunate children in the world. Upon receiving said yoyos I will think positive thoughts. With our own collaboration of, your prize yoyos and my positive thinking anything is possible! After an indeterminate length of time, enough positive thoughts will be collected to potentially change the life of a person less fortunate. YOYONEWS help me take the first step in improving the lives of my fellow human beings. Without you, there is no hope. I want these, but not for myself. The young kids at yoyo club would love to try a few new throws, especially some that might really help out the newer members. I want these yoyos because…why not? I’d take it. Anyway, my real answer: I have lots of friends who want to start yoyoing but I don’t really have any yoyos targeted to beginners. These will help my friends get a new yoyo (for free!!) and learn how to play. We’ll be emailing you for your mailing address. Congratulations! I would absolutely love a set of these YoYoJam – Yomega yoyos to teach 3 of my younger friends to yoyo. Sounds a little cliche and generic, but it is true. I have spare string, bearings, and tools to essentially make a starter pack for them. 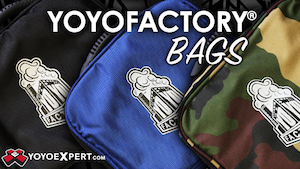 Although some companies have made starter packs and have great yoyos for beginners, I would rather give them these beginner to advance throws that are made in the USA. Not only teaching them how to throw, but how to support a company who is making an honest living. I want these because my initials are RAD and I need some rad yoyos to live up to my name! I would like a set because I can clap with one hand. I’m a first year teacher at a low income highschool in downtown LA and I would love to get these yoyos as prizes for my kids! I teach yoyoing to my advisory class of all boys and they all have out grown their butterfly XTs! These boys are really loving yoyoing and it reminds me of when I used to yoyo with yomegas and fast 201s when I was a kid! Well, yomega is one of the most known yoyo companies for their brain yoyo. 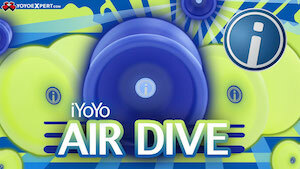 Yoyojam is well known for their plastic/metal design and those two companies together would make a yoyo like no other. I have a couple of yomega yoyos and yoyojam yoyos. My favorite players are Joseph Harris and Dan Dietz. They would make a true game-changer. I CAN’T BREATHE! I CAN’T BREATHE! I CAN’T BREATHE! I CAN’T BREATHE! these are iconic yoyos, yomega has been making quality stuff for eons, and now with both going ham together!? This is epic! I want them to give away to friends! I think these would be a great way to get some curious people going with the yo life. I can’t really give them my lodge or od can I? No, I simply cannot. So, I’ll take these off your hands and start a revolution. Fin. I would want to win these because I’ve always liked both companies. I learned all my first tricks with a fireball. And I throw my classic probably more than anything else nowadays. I want these so I can inform people they can buy the same yoyo at their local stores when they ask me where I got mine. I want these yoyos because I love playing high all yoyos. I like using old school mounts and maneuvers and I really think that these yoyos would be perfect for my style of play and tricks. Well, I would like to win these yoyos, and I can tell you why. If I use a Yomega yoyo at my next contest and I do well, I have a chance at being on the Yomega team, and I believe that these yoyos can help me do that. I also think that they look really nice. I want these throws because yoyo jam and yomega got me into yoyoing with the DM2 and the Maverik. Without them I wouldn’t have been yoyoing today and I would probably never knew this awesome blog existed. Thanks Yomega and YYJ! I want it so bad because, in my MEGA Journey to the Odyssey, i met so many Firestorm that trying stop me from eating bread with JAM. I want these yoyos because when I first started to get into yoyoing about a month ago, yoyonews was the first place I came to check stuff out. I love plastic yoyos and it would be awesome to finally have more than 1 yoyo! I want them so I will have enough plastic yoyos to start a yoyo club at my school in Alberta. I also want them so people in my club will have a cheap high quality yoyo that they can get at a local store. This will also hopefully boost the yoyo community in my town. I want them because yomega was the company who originally got me into throwing in that late 90s boom. When i picked it back up recently, i started back by picking up a a new raider, my old one had cracked due to me being a kid and cranking it too hard followed by picking up a yyj lynn fury and eventually a dm2. These are *the* two companies who birthed and rebithed me into throwing, and I’m beyond excited to get my hands on them! Celcon is by far my all time favorite plastic, and ONLY YYJ seems to use it! As well as I Love Organic shapes and H shapes. Virtually every yoyo I own is one or the other! I Primarily love Oversized/fullsized yoyos due to the more stable feel and the satisfaction of catching such a large yoyo in the hand. Nothing feels better than a nice beefy yoyo and a fresh bind! 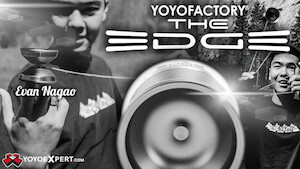 Because I am starting a performance business, Boxed Out Yoyo Entertainment and need yoyos to teach kids. The Journey because the classic butterfly shape is awesome. The Odyssey because I unwisely traded away my surge. The Firestorm because of the specs and the awesome, innovative cap design. Because I support puppies and baby seals. I want them because I’m too honest not to admit I have selfish reasons. I won’t bs ya. I love yoyos and may have a problem. Ill make you a deal though. If I don’t enjoy them ill give them away and give yoyonews.com the credit. Simply because I love plastic Yoyos. They can play as good as metal ones if well machined. And those three looks amazing! I’d like to try some new plastic. I teach yoyoing as a summer school class in a small WI town, and having high quality resonably priced yoyos more widly avaliable will be great for the kids around here. I would love to have all three for the kids to check out before they go off and buy/order their own this summer. i want these because i love both companies! Man, these look awesome! I hope they do come to the mass market! I would want these because Yomega has always had my love ever since I picked up a Yomega Firestore, and it’s been delightful watching them mount a comeback to the modern yoyo world. This collaboration is just amazing, especially on the top of them having the ProDigy being made by One Drop. Glad to see this is also made in the US! Because I am stuck in bed with pneumonia and I need something new to play when I get better. I want these because I have been waiting for a sick plastic collaboration for a very long time! I love the look of these and would love to get my hands on all 3!!! These are awesome, I want them to give away to some new players after I get a chance to throw them around a bit. These look AWESOME!!! I want to win them as I have 3 spaces in my case with their names all over them. Want, want, want!!!!!! Especially the firestorm. I want these because plastic is fantastic. I love the playfulness and colors that only plastic can provide. Yoyo Jam is know for putting out dope plastic throws, and I can tell these are going to live up to their reputation!